Be ready for action. This versatile EMS parka keeps you warm without hindering your movement. Wear the liner and shell together for maximum warmth, or wear each separately for more temperate weather. 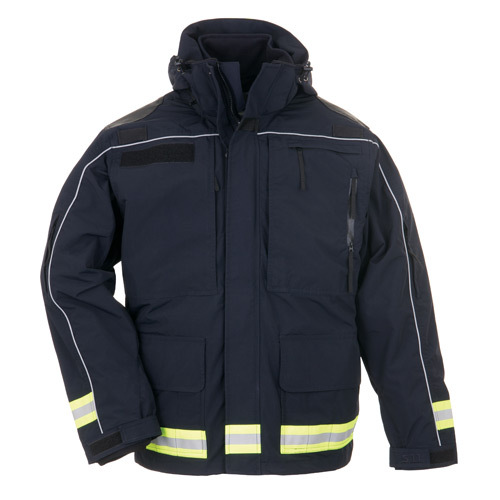 Engineered specifically for EMS professionals, the Responder Parka delivers the functional performance needed to respond quickly and efficiently. Waterproof yet breathable fabric blocks winds and rains without suffocating you with needless bulk. Not only that, the bloodborne pathogen resistant* lining protects you from disease-causing agents. Three-way adjustable hood, hook-and-loop storm cuffs, double storm flap, and elastic corded hem prevent the entrance of bitter breezes and rain, while a water-resistant radio pocket and shoulder mounted mic loops keep you in the loop. Abrasion panels at the shoulders provide gripping action for a backpack, and a patch panel at the right chest secures your ID. Pockets at the chest and sleeves are perfectly sized for EMS equipment. Reflective materials at the hem and sleeves raise your level of visibility in low-light surroundings. An independent laboratory has tested this product and has found that the materials and seams provide passing results when tested in accordance with ASTM F 1671, Standard Test Method for Resistance of Materials Used in Protective Clothing to Penetration by Bloodborne Pathogens. It is important to note, however, that, even though garment materials and seams may satisfy the standards of ASTM F 1671, it might not provide an adequate barrier to viruses in all conditions and our products will not protect the wearer from all bloodborne pathogens and viruses under all conditions. All end users will need to assess the specific hazards in their workplace in order to determine the appropriate types and levels of personal protective clothing and equipment that they might need.